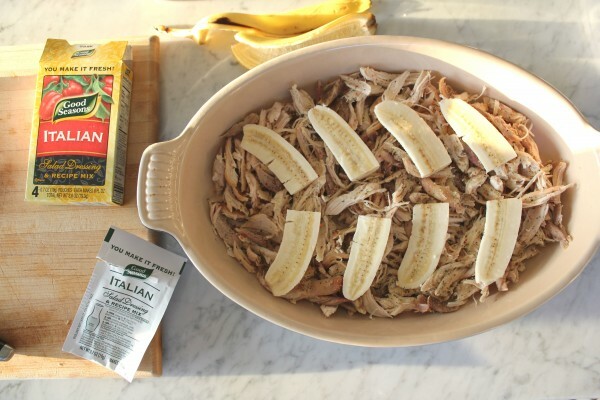 Chilli Creamed Chicken and Banana Casserole, or Flygande jakob, is a Swedish casserole popularized in the late 1970’s. When I opened The Nordic Cookbook, this is not what I expected to find. But there it was, on page 270. The subtext read, Flygande jakob (Sweden) and the ingredient list was improbable: one roast chicken, store-bought dry, Italian salad dressing mix, bananas, cream, Heinz chilli sauce, bacon and salted peanuts. The casserole has seven ingredients: roast chicken, bananas, Heinz chili sauce, bacon, peants, cream and Italian salad dressing mix. But I trusted the author, chef Magnus Nilsson. His restaurant Faviken is one of the most respected restaurants in the world. And the Faviken cookbook was full of unlikely food pairings. Broth of autumn leaves? Raw mussel and wild pea pie? A tiny slice of top blade from a retired dairy cow, dry aged for nine months, crispy reindeer lichen, fermented green gooseberries and fennel salt? I’ve eaten at Faviken, and this is a chef who can turn birch sap and reindeer meat into a memorable amuse bouche. So when he told me that this casserole with Heinz Chili sauce and bananas was “disturbingly delicious,” I believed him. To be fair, The Nordic Cookbook isn’t a collection of Nilsson’s recipes. 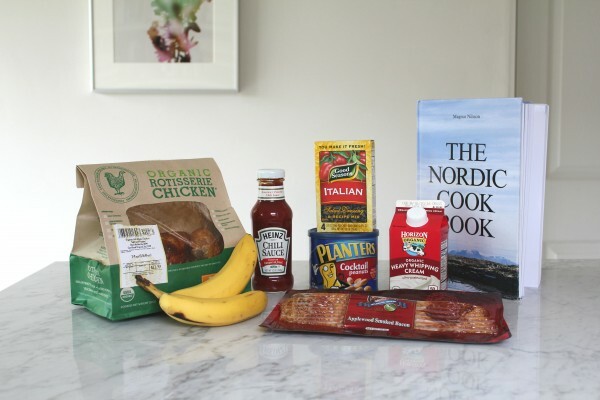 As the book’s author, he crowd-sourced over 700 recipes from grannies and townsmen in Denmark, the Faroe Islands, Finland, Greenland, Iceland, Norway and Sweden. If Nina and Tim Zagat wrote cookbooks, it might look something like this. Flygande jakob is named for Ove Jacobsson, an air-freight employee. How he came to combine these seven ingredients in a casserole remains a mystery. I am a child of the 80’s. Good Seasons Italian salad dressing packets were a pantry staple. My mom would mix ketchup and mayonnaise when I wasn’t looking and tell me it was “Thousand Island.” I loved peanut butter and banana sandwiches. Assembling the casserole requires sprinkling Italian salad dressing spices over grilled chicken and topping it with bananas. As I began to assemble the recipe it dawned on me that my Atlanta pantry in 1989 was not unlike Magnus’s in Sweden. I guess my mom just never had the guts to throw the whole pantry into a casserole dish and bake it. Jonathan Gold is fond of saying that whether or not you like a dish isn’t the point, you have to consider the dish in its cultural context. So as I layered sliced bananas over a bed of grilled chicken, dusty with Italian salad dressing mix, I kept an open mind. I tried to transport myself to Jämtland where the lakes are iced over and the mossy hills blanketed in snow. As I whipped the cream to soft peaks and folded in the Heinz Chili sauce I did so as if I were folding egg whites into a flourless chocolate cake batter. I was careful not to overmix. After topping the casserole with a mixture of whipped cream and Heinz chili sauce, it is ready to go in the oven. I treated the casserole like a soufflé, gently closing the oven door. When it emerged 15 minutes later I was proud of how it caramelized. As I waited for it to cool my husband walked in and declared, “something smells good.” But as the minutes passed the pleasant smell of bacon gave way to a cacophony of odors. The sweet acidity of the Heinz chili sauce began to tickle my nose. The peanuts, now warm from sitting on top of the casserole, released their oil. I had convinced myself that Magnus couldn’t be wrong, but the situation was turning sour. “It smells like throw up,” my husband said. We each took a bite. I heard Jonathan in my ear. Remember, this is a culture that eats lutefisk. Even Magnus admits that Swedish food culture gave rise to the world’s smelliest food, sour herring. There are winter months when the sun doesn’t stray above 45 degrees in the sky. name in Swedish, flygande Jakob or Flying Jacob in English. The combination of chicken, cream, Heinz chilli sauce, salted peanuts and one of Sweden’s most cherished fruits, the banana, is truly spectacular and one of the strongest lasting cultural expressions of the early eighties, at least in my opinion. Oh, it is also seasoned with readymade Italian salad dressing mix. If you search the internet, flygande jakob gives you 109,000 hits, not bad for a dish which only exists in one country with not even ten million inhabitants. Serve flygande jakob with white rice, shredded iceberg lettuce and cucumber (no vinegar, please), then lean back, close your eyes, and pretend you are me eating in 1989 and enjoy yourself. Preheat the oven to 225°C/435°F/Gas Mark 7. Pull the meat off the chicken carcass and tear it into rough pieces. Spread the meat out in an ovenproof dish and sprinkle generously with the Italian seasoning. Arrange the banana pieces on top of the chicken, cut surface facing upwards. 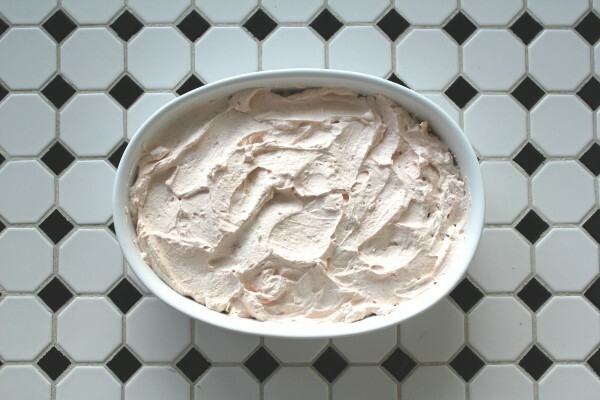 Whip the cream to soft peaks, then fold in the chilli sauce. Spread over the chicken and banana and bake in the oven until the surface is nicely caramelized. Meanwhile, fry the bacon in a pan over a medium heat until it is crisp. Drain on paper towels. Remove the casserole from the oven and leave it to sit at least 10 minutes (otherwise you risk burning your mouth on the lethally-hot banana). Sprinkle on the bacon and peanuts and serve.